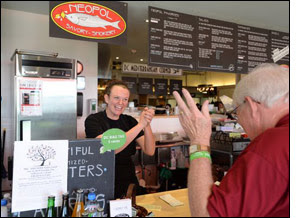 Businesses Actually Welcoming People Who Are Deaf? – Deaf and Hard of Hearing Services Center, Inc. Businesses Actually Welcoming People Who Are Deaf? BREAKING NEWS: July 12, 2014. USA Todayreports that when Steve Walker was a student at Gallaudet University (Washington, D.C.) in the 1980s, the school for the deaf and hard of hearing was a very different place than it is today. Students then were advised not to venture outside the campus, because most people in the surrounding neighborhood didn’t speak sign language. Students didn’t feel welcome in the outside community, and struggled to communicate in restaurants where they couldn’t understand the servers. As the school celebrates its 150th anniversary, Walker says that has changed. Have your student(s) watch this short sign language exercise that teaches some of the signs used in a restaurant and other dining situations. Signs in the video include “restaurant,” “waiter/waitress,” “order,” “food,” “table,” “drink,” and more. Or, watch this short skit by deaf teenagers which offers practical tips for communication with non-signing deaf persons such as: the importance of visual cues (pointing to items on a menu), the need to look at any person who is deaf when you are communicating with them, and more. For further study, browse our catalog and be introduced to over 200 titles in the Sign Language section of the DCMP media library. Or, if your students like the skit by teens listed above, introduce them to other titles in the series by teens that present challenges and solutions to different real-life situations.